Alzheimer’s disease is slowly progressive and irreversible brain disease which is one of the most common cause of dementia . In AD patients not only suffer from cognitive but also motor and sensory loss . Although the mechanism of AD is not well understood still AD pathology is characterized by extra cellular amyloid-β deposits and interacellular neurfibril tangles formation of hyperphosphorylation of tau protein. Being irreversible and neurological damaging disease, its very important to detect and diagonse at earlier or at some controlable time point. Some useful AD diagonstic biomarkers are required for this purpose. These biomarkers should also fullful the criteria of usefulness for AD detection. Biomarkers should become abnormal with the progression of disease in other words they should be dynamic and correlate with clinical symptom and severity of disease . Recent research on use of specific AD biomarker for disease staging in vivo shows that Aβ dynamically correlates with disease at different stages of disease progression . But Aβ level varies in patients. Which suggests, through process of Aβ production starts earlier but Aβ as a biomarker only is not relibale, therefore alternative biomarker must be found along with Aβ generation process. Aβ can be produced through proteolytic processing of APP (amyloid precursor protein), which takes central position in AD pathogenesis. APP is single-pass transmembrane protein with larger ectodomain. Although the physiological functions of APP are not well known but has neuroprotective function and positive effect on cell growth . APP is mainly produced in neurons and rapidly metabolized by secretase enzymes through alternative splicing by two pathways  . Nonamyloidogenic processing of APP involving two secretases α-secretase and γ-secretase while in amyloidogenic processing β-secretase (identified as transmembrane aspartase protease BACE1) and γ-secretase are involved. Product generated during both processings have soluble ectodomain (sAPP α and sAPP β) respectively along with identical product called AICD (intracellular C-terminal fregmenets). More importantly amyloidogenic processing generates Aβ, a sequence contained by sAPP β part. In brain APP processing generates mainly Aβ40 and Aβ42 based on 40 and 42 amino acids residues depending on secretases ( see secretase table 1) through alternative splicings . Along with regulatory subunits of γ-secretase complex, catalytic subunits presenilin1 (PS1) and presenilin 2 ( PS2) are involved mainly in deciding the length of these toxic form of Aβ. These toxic forms of Aβ can aggregate and form plauqe that has more toxic effect . With the progression of AD, symptoms also spread along with it depending on the vlunerability of different party of nervous system. More vlunerable areas are suppose to be effected earlier to others, the reason AD smptoms appear in different regions in a sequential order and consistency, although meachnism is poorly understood. Out of these early symtoms, one is olfactory impairement , which suggest olfactory system is one of the early vlunerable region during AD progression. Therefore finding the correlation between early phenomen of APP processing and one of ther earlier vlunerable area of nervous system might lead to valueable insights. This research has focused on APP processing in peripheral structures, the olfactory epithelium(OE), as well as CNS structures responsible for processing of incoming olfactory signals such as olfactory bulb(OB). The present study found unique APP processing in OE that has significance in providing not only possible biomarkers (including 25kDa, 55kDa and 80kDa) that can be used for screening and detection of AD before plaque formation but also for treatment purpose. Additionally, PS2 increased level was found in OE that possibly involved in unique APP processing and might also be crucial for understanding the γ-secretase role and controlling AD through γ-secretase as a therapeutic target. Involve in regulation of α-cleavage, may promote sAPPα. APP processing enzyme with constitutive and regulated α-secretase activity. BACE1 activity is thought to be the rate-limiting factor in Aβ generation from APP. Cleaves APP near the α-secretase site much more efficiently than at the β-secretase site. presenilin-1 gene (PSEN1) mutations increase Aβ generation. Presenilin 2 (PS2) mutations increase Aβ generation. Nicastrin modulates presenilin mediated notch/glp-1signal transduction andAPP processing. Aph-1 and pen-2 are required for Notch pathway signaling, gamma-secretase cleavage of betaAPP, and presenilin protein accumulation. Transcriptional regulation of APH-1A and increased γ-secretase cleavage of APP. Table 1. Secretases responsible for APP processing. In this study, heterozygous Tg2576 mice were used, which express a human amyloid-β precursor protein (APP) variant linked to Alzheimer’ disease, as developed and described previously .Age-matched non-transgenic littermates were served as wild-type control. All animal experiments were approved and conducted in accordance with guidelines of Ethic Committee of Seoul National University & DGIST. Another AD model used in this study was Tg6799 mice, which expresses human amyloid precursor protein (APP) with three familial Alzheimer’s disease point mutations and two human presenilin1 mutations thus also known as 5x FAD mice. Both of these mutation types mainly contribute to increased production of Aβ42 . Age-matched non-transgenic littermates were served as wild-type control. All animal experiments were approved and conducted in accordance with guidelines of Ethic Committee of Seoul National University & DGIST. Table2. Transgenic models used for this study. Food buried, behavior test was performed to measure the mice smell ability to find a buried food pellet using olfactory cues as previously described    . Olfactory test was taken blindly without revealing any genotypic information of mice before and during the experiment. Mice were deprived of food around 35 hours with free access to water. Before starting the experiment, adaptation time was provided 5~10 min to let them adapt in new prepared cage with new bedding material. This step was important for mice to be adapted to the new environment so that they would able to focus on finding food in a new environment. Similar cage were prepared with bedding material depth approximately 5 cm and food pellet was buried 2.5 cm below the surface. Latency or cut-off time ~15 min maximum was provided to each mice to find buried food. Latency time was recorded, as time between mouse inserted into the cage and grasping the food pellet, precisely using video tracking software and system (EthoVision xt 9). "Biomarkers for Alzheimer’s Disease Progression." UKEssays.com. 11 2018. All Answers Ltd. 04 2019 <https://www.ukessays.com/essays/medical/biomarkers-alzheimers-disease-4235.php?vref=1>. "Biomarkers for Alzheimer’s Disease Progression." All Answers Ltd. ukessays.com, November 2018. Web. 24 April 2019. <https://www.ukessays.com/essays/medical/biomarkers-alzheimers-disease-4235.php?vref=1>. UKEssays. November 2018. Biomarkers for Alzheimer’s Disease Progression. [online]. Available from: https://www.ukessays.com/essays/medical/biomarkers-alzheimers-disease-4235.php?vref=1 [Accessed 24 April 2019]. UKEssays. 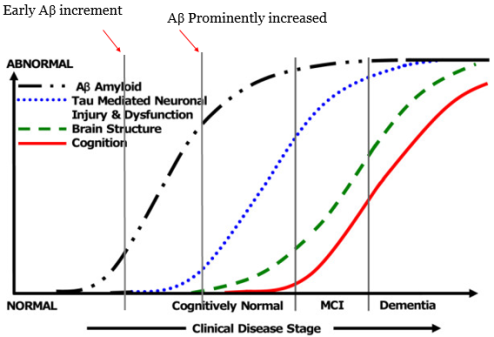 Biomarkers for Alzheimer’s Disease Progression [Internet]. November 2018. [Accessed 24 April 2019]; Available from: https://www.ukessays.com/essays/medical/biomarkers-alzheimers-disease-4235.php?vref=1.